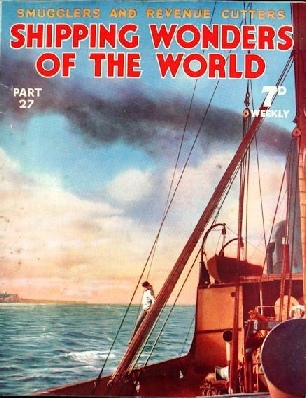 Part 27 of Shipping Wonders of the World was published on Tuesday 11th August 1936. This issue included a colour plate illustrating the Empress of Britain, which forms the frontispiece to Volume 2. The same illustration was used as the cover to part 5. The plate was attached to page 837 of part 27. This week’s cover shows a sailor looking forward to catch a glimpse of the land ahead. The sailor is on board the P & O cargo vessel Eston (1,487 tons gross) on her way from Sunderland to Havre with a cargo of coal. This small but efficient vessel is typical of the cargo vessels that make up a large portion of British shipping. The shortest mail route from Great Britain to the Continent is from Dover to Calais. 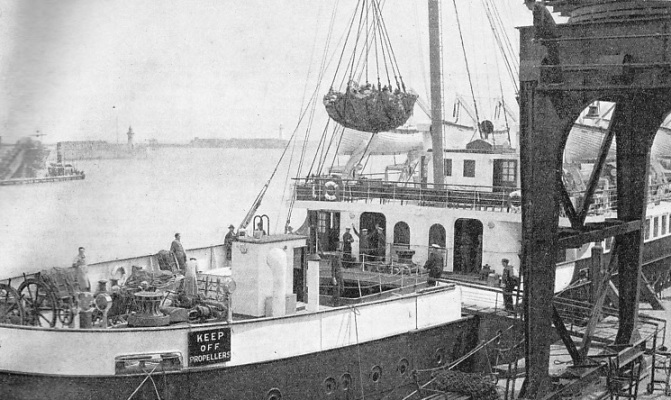 This photograph shows mail-bags being loaded into the Southern Railway’s cross-Channel packet Canterbury, a twin-screw vessel of 2,910 tons gross. One of the latest Southern Railway steamers, she has a length of 329 ft 7 in, a beam of 47 ft 1 in and a depth of 16 ft 10 in. It was not until more than fifty years after the keel of the Great Eastern was laid down that vessels of larger dimensions were put into commission. She was a unique ship, provided with sails and paddles as well as with a screw propeller. When the Queen Mary sailed on her maiden voyage not many of us recalled that fewer than eighty years ago a transatlantic liner was built whose length was nearly three-quarters that of the Queen Mary. This first leviathan of the seas was the famous Great Eastern. This week a chapter by F E Dean gives a full account of this interesting liner. She had six masts and five funnels and was propelled by a screw, paddle wheels and sails. The Great Eastern, however, was an unlucky ship. She was built at a cost of about £900,000 at Millwall, at one time the scene of great shipbuilding activities. As the River Thames at Millwall was not wide enough to take a lengthways launch, the vessel was launched broadside on. Before she reached the water, however, she stuck on the slipways and it was only at great expense and by the building of special machinery that she was eventually put into the water. (Top left) A FIVE-MASTED AUXILIARY SCHOONER of 1,859 tons gross, the Werner Vinnen is one of the fleet built for the firm of Vinnen of Hamburg about 1922. Her rig is peculiar having squaresail on the fore- and mizenmast. (Top centre) THE PREUSSEN, A FIVE-MASTED FULL-RIGGED SHIP of 5,081 tons gross was the only one of her type ever built. This Photograph shows her wrecked near the South Foreland in November 1910. Previously a collision had carried away her foremast. The Preussen was built in 1902. She was 407 ft 9 in long, with a beam of 53 ft 7 in. (Top right) TO DISTINGUISH A KETCH FROM A YAWL the position of the mizenmast is a rough and ready guide. In the fishing ketch Vanduara of Plymouth, the mizen is forward of the rudder post. In the yawl Japonica (bottom right), a racing yacht designed by Herreshoff in 1895, the mizen is abaft it. The yawl and the ketch set a headsail, a mainsail and a mizen, and usually a topsail above the mainsail. 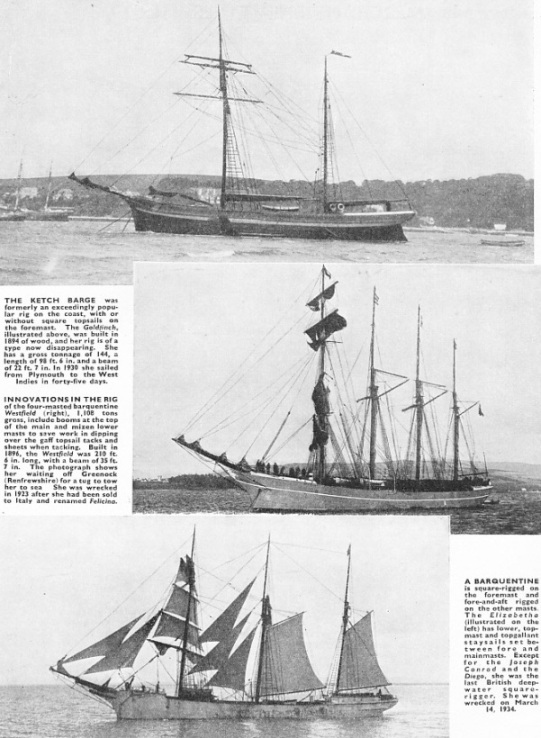 (Bottom left) SPRITSAIL BARGES are a type to be seen on the River Medway and Thames. The mainsail is set on a sprit extending from the foot of the mast. This photograph shows the Gertrude May of Rochester. A barge of 60 tons register, she was built at Sittingbourne, Kent, in 1893. 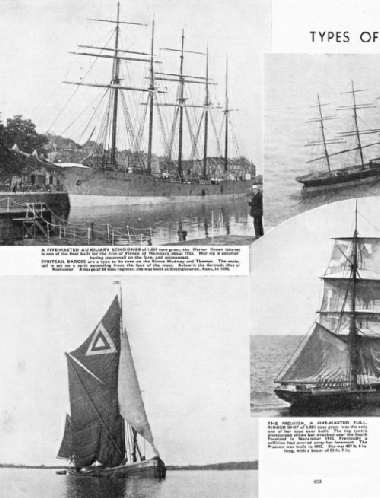 (Bottom centre) BRIGS ARE SQUARE-RIGGED on the two masts though a spanker was generally set on the mainmast, as shown in this photograph of the Evangelistria. She was a Greek vessel, and in 1892 there were forty-three Greek and Turkish brigs of that name on the register. They were all between 100 and 200 tons. Few maritime nations can claim a mercantile marine history as proud as that of France. French shipping is of great diversity, ranging from fine Grand Banks fishing fleets to fast transatlantic liners. Shrewd common sense, an ability to look ahead and a practical strain have always been characteristics of the French nation; and in none of its activities have these characteristics been seen to better advantage than in its shipping. This chapter traces the history of the French Merchant Service from its earliest days to the present time, when the giant transatlantic Normandie, the world’s largest ship flies the tricolour. Written by Frank Bowen, this is the fifth article in the series on Sea Transport of the Nations. 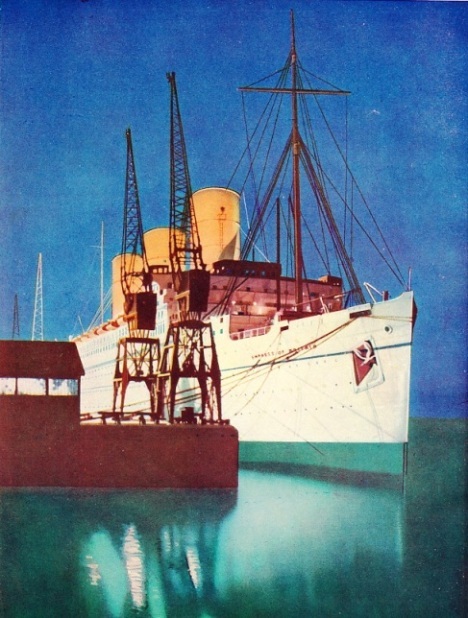 ILLUMINATED BY FLOODLIGHTS, the distinctive appearance of the Empress of Britain is emphasized. She is a Canadian Pacific liner with a gross tonnage of 42,348. One of the world’s largest ships, she has an overall length of 760 ft 6 in and a moulded beam of 97 ft 6 in. Her moulded depth to the top of her sun deck is 100 ft 6 in. The chapter beginning on page 141 fully describes this magnificent vessel. She was built in the same yard as the Queen Mary and was launched by H M King Edward VIII (then HRH the Prince of Wales) on June 11, 1930. Many and ingenious were the devices used by the smugglers of the eighteenth and nineteenth centuries to deceive the Revenue men. There are few stories of adventure as exciting as some of the incidents in the hazardous life of thee law-breakers. This chapter is by Lieut-Com. E. Keble Chatterton. Sailing ships were formerly classified by their size or employment, but it is now the custom to distinguish different types of vessels by defining their characteristic rigs. This chapter is by Frank Bowen and is designed to clarify, with its numerous illustrations, the definitions of the various rigs used. 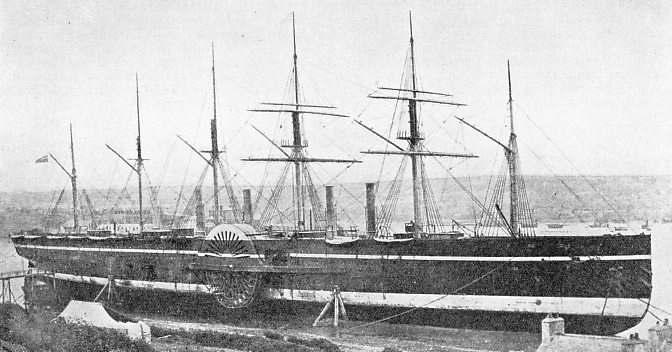 A CONTEMPORARY PHOTOGRAPH OF THE GREAT EASTERN beached for examination. Her original paddle wheels were 56 feet in diameter and weighed 90 tons. These enormous wheels were torn off in the Atlantic in 1861. They were replaced with stronger paddles 50 feet in diameter. The paddle engines indicated 3,411 horse-power and drove the Great Eastern at 7¼ knots on trial. 2½ in. They are handsome ships with a slightly raked stem and cruiser stern. There are one funnel and two pole masts, and all accommodation and superstructure are concentrated amidships. 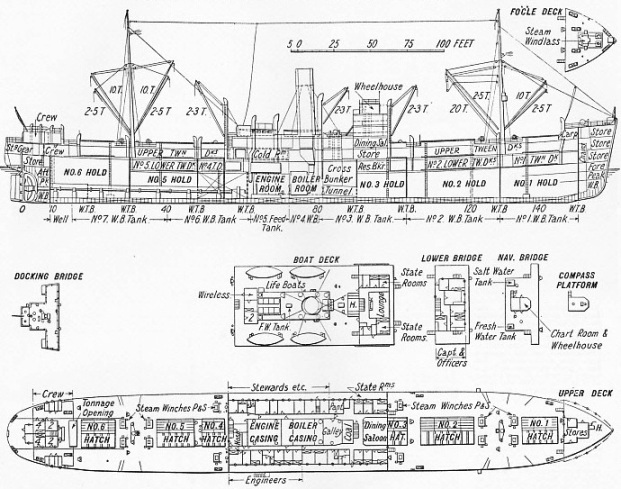 The superstructure is arranged on the shelter deck around the engine-room boiler-casings and on the deck above. A dining saloon at the forward end of the superstructure seats twenty persons, and there are also four single-berth staterooms and two double-berthed staterooms, in addition to the officers and crews quarters. Insulated chambers for meat, vegetables and cargo are situated at the far end of the machinery casing on the second deck. Machinery for handling the cargo comprises twelve steam-driven winches, and a coaling winch with extended ends on the boat deck. The propelling machinery consists of a triple-expansion steam engine, with cylinders 24½ in, 40½ in and 67 in in diameter and a piston stroke of 51 in. This engine operates in conjunction with a low-pressure exhaust turbine on what is known as the Bauer-Wach system. The total heating surface is 2,597 square feet for each boiler. Steam for the auxiliaries is taken from the superheated steam supply and passed through superheaters. The carriage of letters and parcel post to outlying parts of the world is one of the most important services rendered by shipping. The organization of the overseas postal services is remarkable for its complexity and its efficiency. This chapter is written by Captain E C Goldsworthy and is written from first-hand experience, for he was formerly an officer in mail ships. THE KETCH BARGE was formerly an exceedingly popular rig on the coast, with or without square topsails on the foremast. The Goldfinch, illustrated right, was built in 1894 of wood, and her rig is of a type now disappearing. She has a gross tonnage of 144, a length of 98 ft 6 in and a beam of 22 ft 7 in. In 1930 she sailed from Plymouth to the West Indies in forty-five days. 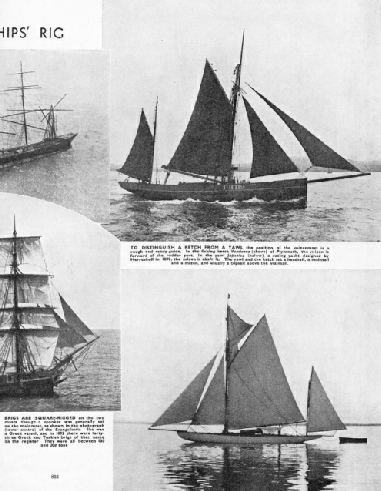 INNOVATIONS IN THE RIG of the four-masted barquentine Westfield (right), 1,108 tons gross, include booms at the top of the main and mizen lower masts to save work in dipping over the gaff topsail tacks and sheets when tacking. Built in 1896, the Westfield was 210 ft 6 in long, with a beam of 35 ft 7 in. The photograph shows her waiting off Greenock (Renfrewshire) for a tug to tow her to sea. She was wrecked in 1923 after she had been sold to Italy and renamed Felicina. A REVENUE CUTTER in full chase of a smuggler. This illustration is reproduced from an aquatint in colours after T. Soutter, published in 1794 and now preserved in the famous McPherson Collection at the National Maritime Museum, Greenwich. The revenue cutter is called the Greyhound. Scientific experiment and research have now made it possible for men in flexible diving dresses to descend to depths as great as 300 feet below the surface of the sea. The perils that are met at such depths cannot be paralleled elsewhere. This chapter is by David Masters and is concluded in part 28. A BARQUENTINE is square-rigged on the foremast and fore-and-aft rigged on the other masts. 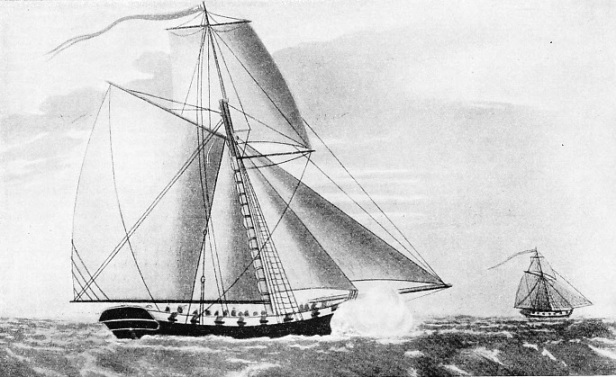 The Elizabetha (illustrated above) has lower, topmast and topgallant staysails set between fore and mainmasts. Except for the Joseph Conrad and the Diego, she was the last British deep-water square-rigger. She was wrecked in March 14, 1934. 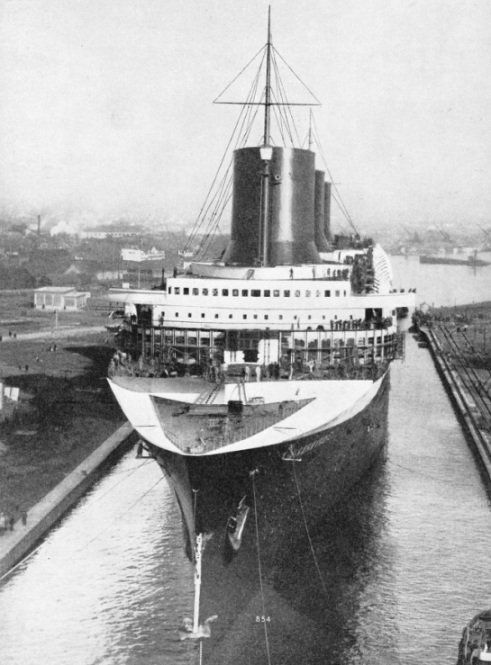 A GREAT TRANSATLANTIC LINER, the largest vessel under the French flag, presents an imposing sight as she is towed into dock. The Normandie has a gross tonnage of 86,496 (figure revised in May 1936). She was completed in 1935 at St Nazaire, at the mouth of the Loire, for the Compagnie Generale Transatlantique. ANXIOUSLY WAITING ON THE SURFACE while divers of the United States Navy established a world’s record by descending to a depth of 304 feet. The submarine F 4 sank near Honolulu, in the Pacific Ocean, on March 25, 1915. 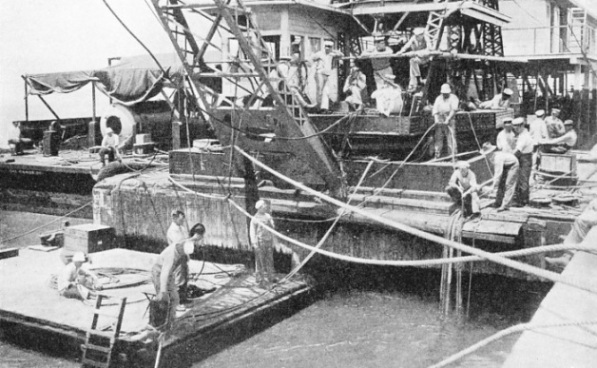 The divers went down to see that the salvage slings were in place under the sunken submarine.